Today you are hard-pressed to turn on a TV, flip through a magazine, or read a blog post without seeing an ad encouraging you to buy some new connected home device. From smart doorbells and lights to responsive thermostats and appliances, the list of tech-enabled devices for the home continues to grow daily. Yet even with that, according to a 2017 study by research firm Gartner of households in the US, UK, and Australia, only 10 percent had connected home solutions. While home security (an industry which began more than 150 years ago) continues to lead the way with a roughly flat 25 percent household penetration, solutions like home energy management, home automation, home monitoring and the like are all still only penetrating the early adopter and technology hobbyist portions of the market. So, with all this hype, why then haven’t we crossed Geoff Moore’s classic “chasm” between early adopters and the mass market? The fundamental problem we see with the current approach to “smart homes” is a focus on novelty rather than everyday utility. Smart home security has and will continue to thrive, as it’s solving what is perceived to be a real need versus an aspirational need, but other home automation products (smart lights, thermostats, door bells, garage doors, etc.) are often solutions looking for a problem, rather than a solution to an actual known problem. All too often when one thinks of “smart home,” most of the value creation revolves around that first week of usage (the definition of a novelty) and the ability to “wow” visitors and guests with a technology demo (not exactly a utility). So how do we refocus on a real need and ultimately accelerate both market growth and value creation through smart home implementation? It is our belief that a large and growing market where home automation can provide extreme utility is in the older adult market. DEVICE MANUFACTURERS – As with most technology, today’s smart devices are very often designed for the next generation, not the existing generation. To deliver on the promise of home automation for senior living communities and 55+ communities, designers of these devices must understand the needs and patterns of older adults. Accessibility and a senior-centric design must be a primary feature, not an afterthought. A SHIFT FOR BUILDERS AND ARCHITECTS – Builders and architects must both increase their smart device technology knowledge base and form strategic partnerships with the top smart home and connected device companies. New communities and homes should be designed and built from day one to be smart, but also upgradable and adaptable. Ideal strategic partners will not only drive thought leadership but provide open, extensible, supported platforms that allow for innovation today and into the future. INTEGRATION AND SUPPORT – Today’s smart home market is extremely fragmented and lacks end to end integration and support. To deliver on the promise of smart homes for older adults providing end-to-end integration platforms, which are both open/extensible and work cross various protocols/devices, will be critical. While DIY (do it yourself) installation continues to be a critical for scale, ongoing support, maintenance, and monitoring is the key to long term adoption and success. GOVERNMENT – Governments have a role to play here as well. As the global senior population continues to grow, governments would be wise to evaluate more aggressive and expansive home renovation tax credits, as it applies to both physical upgrades (ramps, grab bars, etc.) and smart home technology. There has been acceleration of these types of programs globally, but there is much more to do. Older adults represent a large, growing market in the building and design space, and we have no doubt is poised to lead the adoption of smart home technology—not because they are early adopters or because the technology is “cool,” but rather because smart homes can empower older adults to live simpler, heather, and happier lives. With the right focus by the various key stakeholders, we have little doubt older adult consumers may be the key to delivering on the promise of the smart home. 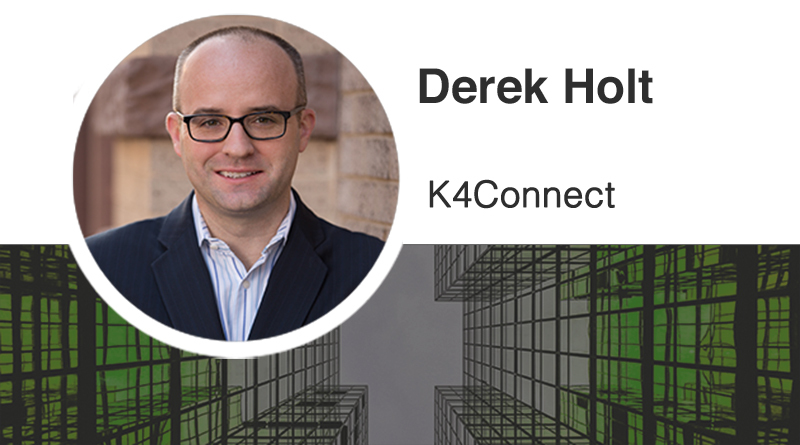 Derek Holt is President of K4Connect, an IoT software company focused on creating solutions that serve and empower older adults and individuals living with disabilities. He may be reached at k4connect.com.